"Sandpiper" is a beautiful Oceanfront home that has many improvements including new paint, new TV's throughout, new furnishings, & new decor throughout. 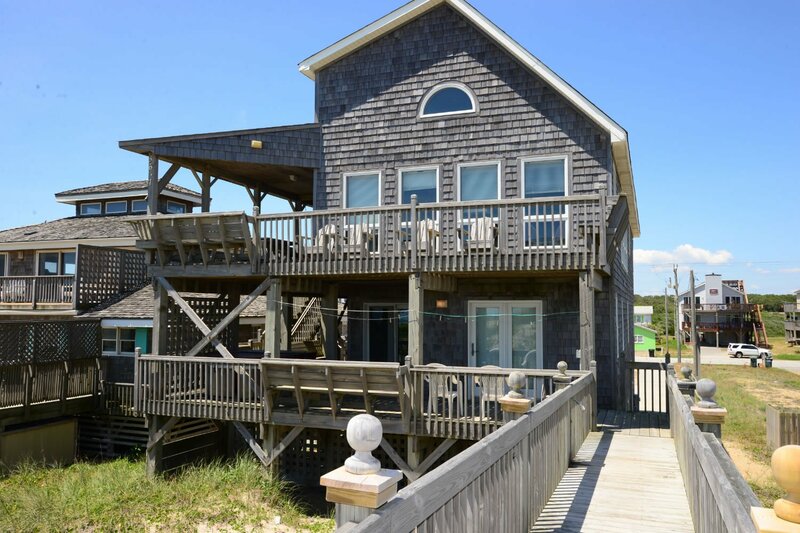 Everyone in your family will be waiting in anticipation for their vacation in this wonderful Nags Head Oceanfront home. The living area is glassed lined along the Oceanfront which allows fabulous Ocean Views, & the Hot Tub is located on a mid-level deck where you can relax & watch the Moon & Stars above the blue Atlantic. A walkway to Beach w/Dune Top Deck affords easy access to a beautiful, white sandy Beach & the home is centrally located close to Jockeys Ridge State Park & all the great dining & shopping Nags Head has to offer. A fantastic game room featuring a full size 9 ft. Pool Table & sitting area w/Wet Bar is the perfect place for entertaining & enjoying the company of your family & friends. This home is dog friendly & the owners request that you please bring crate(s) to put your dog(s) in if you are going to leave it unattended. Ground Level: Parking for 5 Cars, Covered Entry, Nice Rec. Room w/9 Ft. Pool Table, TV, & Wet Bar w/Microwave & Mini-Refrigerator, Stereo w/CD, DVD, Children's Play Room w/TV, Full Bath, 1 Bedroom w/Queen & 1 w/Futon, Enclosed Outside Shower, Grilling Area, Picnic Table, Park Grill, & Handicap Friendly w/Wider Doors. Mid Level: 5 Bedrooms (1 w/Queen, TV, & VCR, 1 w/Queen & Shared Bath, 1 w/Duo Bunk, 1 w/Queen, TV, & VCR, & 1 w/2 Bunk Sets) Shared Full Hall Full Bath, Sitting Area w/CATV, Wrap Around Deck w/Hot Tub & Ocean Views, & Walkway to Beach. Top Level: Living/Dining/Kitchen Area that is Spacious & Open w/Great Ocean Views, Gas Fireplace, TV, VCR, DVD, Half Bath, 1 Master Suite w/King, TV, VCR, & Full Bath, Covered Deck, & Sun Deck. Features include: C/AC & Heating, Washer/Dryer, Dishwasher, 2 Microwaves, 3 Phones, 9 TVs, VCR, DVD, Wireless Internet, & Ceiling Fans. Two Mature Dogs Allowed w/Fees. This is a Non-Smoking Unit. Loved the house and the view very much. We have been at the Sandpiper several times and always have a great time. The place is well maintained and the view is wonderful. We had a wonderful stay at the Sandpiper. The house was lovely and well stocked with everything we could ask for, especially the kitchen. The pool table was the hit of the week, given the frigid outdoor temps. We could tell that the owners put a lot of thought and care into the house's furnishing--including warm extra blankets-- and amenities. The only small item that we would like to have seen would have been a tea kettle--but a pot worked well. Also, there was a mix up with the labeling of the lights in the master bedroom--tiny thing. All said, the house was perfect and we loved the view, the location, and hope to come back next year. Beautiful decor throughout the entire house. House is very comfortable and accommodating. We had absolutely everything we needed. Wonderful "local" and appropriate decor. Very thoughtful. Best equipped cottage we have rented in 54 years!! This was our 5th year in this house and we love it. The view can't be beat, and the decor update last year made a big difference. Very well equipped kitchen. Very comfortable home and well furnished. The home was comfortable and spacious. Perfect for a group vacation. We used the pool table, several televisions and really enjoyed the large dining table. Excellent home! They moved the lifeguard chair so the beach was more crowded than usual but with the rough waves it was nice to have some extra eyes on the kids. Good location to Kitty Hawk Kites. The new furniture and paint are lovely and a huge improvement. Great location and partial covered porch a real plus! Deck on dune great for sunset! We really love this home and plan to come back in 2015!